Comcast announced today that it has reached a significant milestone in its Xfinity WiFi network in Illinois, Northwest Indiana and Southwest Michigan by eclipsing 50,000 hotspots. With hundreds of thousands of new hotspots planned this year, the region is one of Comcast’s largest contributors to its march toward launching one million nationwide access points comprising the largest WiFi network in the country. “Having the largest WiFi network in the region and the nation is a major benefit for our customers, who are turning to WiFi more than ever because they want high-speed 24/7 access to their TV, communications, home security and automation and other Xfinity services on the go,” said John Crowley, senior vice president of Comcast’s Greater Chicago Region. Chicago Tribune reporter Robert Channick talks about Xfinity WiFi. Eligible Xfinity Internet customers can access Xfinity WiFi hotspots at no additional charge by selecting “xfinitywifi” from the list of available networks on their laptops or mobile devices and enter their Comcast ID or email and password. After the initial sign in, customers will be automatically connected to the network whenever they are in a hotspot location. It is easy to locate hotspots by downloading the Xfinity WiFi App, available on iOS and Android devices, or by visiting the hotspot finder map online at www.xfinity.com/wifi. Xfinity WiFi Outdoor Hotspots: Comcast has placed Xfinity WiFi hot spots in locations across the region, ranging from shopping centers and commuter stations to parks and universities. 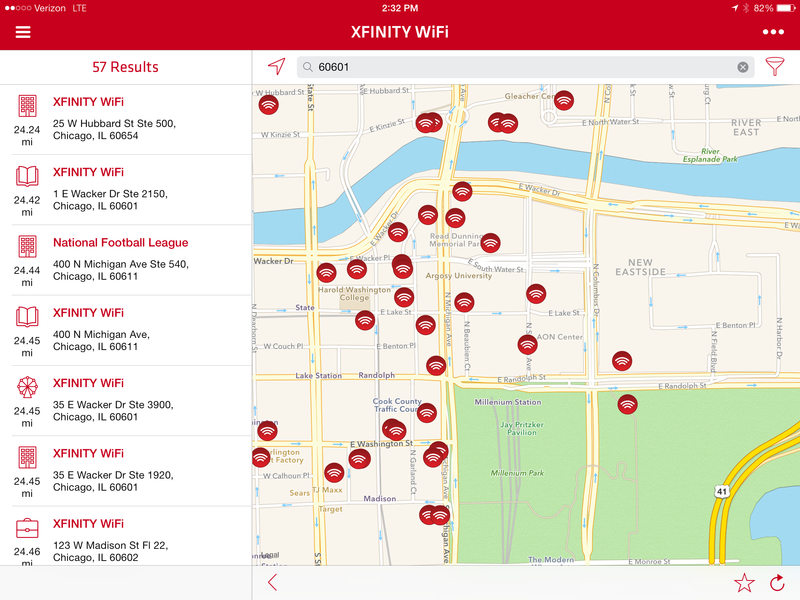 Xfinity WiFi Neighborhood Hotspots: In June of last year, Comcast announced its plans to create millions of WiFi access points for its customers through a neighborhood hotspot initiative. Comcast is the first major Internet Service Provider (ISP) in the country to deploy this innovative technology. This new initiative gives customers with Xfinity Wireless Gateways an additional “xfinitywifi” signal (or SSID) in their home that is completely separate and distinct from the private and secure home WiFi signal. Offered at no additional cost, the additional WiFi signal will allow visiting Xfinity Internet subscribers instant, easy access to fast and reliable WiFi without the need to share the home’s private network password and without an impact to the home subscriber’s speed. And since visitors sign in with their own Xfinity credentials, their usage and activities are tied back to their own accounts, not the homeowner’s. As part of this initiative, Comcast will add hundreds of thousands of hot spots in the Greater Chicago Region over the next several months. Xfinity WiFi Hotspots in Business Locations – Additionally, new Comcast Business customers with Starter Internet service or above can opt to receive an Xfinity WiFi hotspot at no additional charge when they order the service. Already, in just once year since the network launched, nearly 9,000 businesses in the region have opted for Xfinity WiFi hotspots.